From scissors and staplers to car keys and cell phones, we pass objects to other people every day. We often try to pass the objects so that the handle or other useful feature is facing the appropriate direction for the person receiving the item, but new research shows that we’re less accommodating when it comes to handing over our own belongings. Indeed, picking up objects is such a routine part of everyday life that we don’t often think about how we do it, but research shows that our actions often contain a prosocial element. When we pick up a mug, for example, we typically pick it up by the handle because that is most comfortable. But when we hand the mug to someone else, we might turn it so that the handle faces the person receiving it. Constable and colleagues wanted to find out whether specific social factors, such as ownership, might influence this behavior – that is, are we just as helpful when passing our own mug as we are when passing someone else’s? In two experiments, the researchers examined passing behavior among 42 pairs of friends. A week or two before the actual experiment, each participant received a mug to keep; the mugs varied only in their background color. The participants were told to use their mug every day, at home or at work, and to make sure that only they used it. This instruction was given to ensure that the participants would feel ownership over the mug. For the experiment, the friends sat across from each other at a table and the experimenter placed a mug in a specific location on the table. One participant, designated the “passer,” was told to pick up the mug and place it in front of his or her friend in a natural manner. In some cases, the friend receiving the mug was told to pick it up by the handle; in other cases, the friend was instructed to remain still. The person doing the passing and the mug that was being passed both varied randomly from trial to trial. The researchers tracked the location of each participant’s hand and the location of the mug using a motion-capture system. 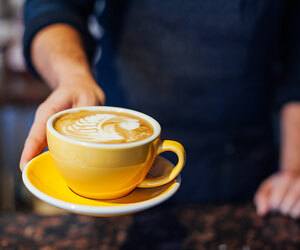 In line with previous research, people passed the mug slightly differently depending on whether the friend was going to pick it up afterward – that is, passers rotated the handle closer to the friend’s hand when they expected him or her to grasp the mug. Interestingly, the researchers found that passers rotated the handle slightly less when handing over their own mug compared to when they handed over someone else’s mug. This less helpful behavior occurred both when they passed their friend’s mug and when they passed a mug belonging to the researcher, a relative stranger. “These findings reveals how the subtleties of our social world can play out in how we interact physically with objects and people,” Constable concludes. Co-authors on the research include Andrew P. Bayliss (University of East Anglia), Steven P. Tipper (University of York), Ana P. Spaniol (Universidade Federal do Rio Grande do Norte), and Jay Pratt and Timothy N. Welsh (both of the University of Toronto). This research was supported by the Ontario Ministry of Research and Innovation and by Natural Sciences and Engineering Research Council of Canada Grants 2015-06482 (to T. N. Welsh) and 194537 (to J. Pratt).